An extremely important part of a self-portrait is expression. A portrait with a typical, tranquil expression is not particularly memorable; it will fade into the multitude of similar portraits without a second thought. It is for this reason, along with my tendency to make this face a lot, that I chose this particularly unflattering, disgusted look. I wanted my portrait to be not only a demonstration of my skill in charcoal, but also to have memorable and attention-grabbing material. From my observation, this worked exactly as intended. At the Fall 2015 SUNY Student Art Show, where this piece was exhibited, I watched several people do a double take after their first glance at the piece and stopped to look closer. 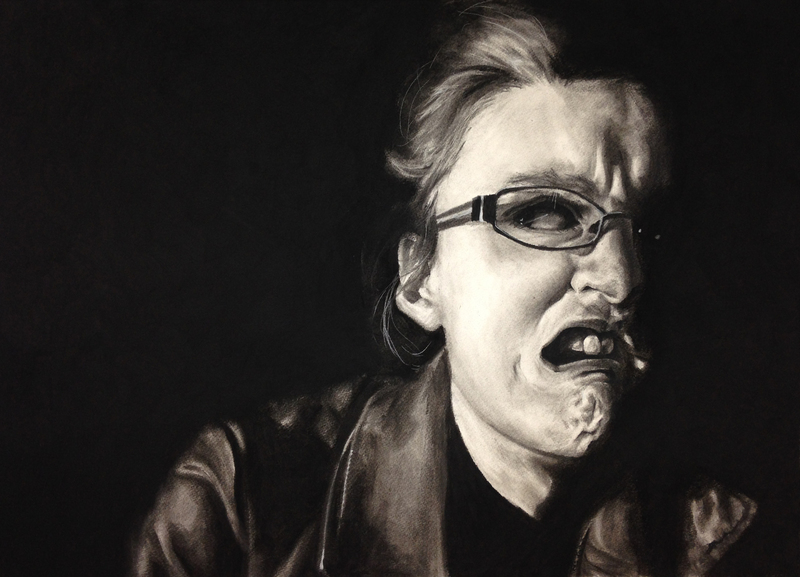 This entry was posted in Best Work, Non Time-Based and tagged Charcoal, Figure and Motion, Self Portrait, Strathmore. Bookmark the permalink.